Yesterday (June 3) was National Running Day. In celebration of this day, I’d like to share some information and tips from my running adventures with Andi. Bart Yasso said, “I often hear people say they are not real runners. We are all runners, some just run faster than others. I never met a fake runner.” I love this quote because I have often thought of myself as a “fake” runner. Throughout my childhood I hated running. As I got older I started running more and have since developed more of a love/hate relationship with it. The love part usually comes when I am done with my run for the day! As hard as running and motivating myself to run can be, I have found that running with my daughter Andi is pretty fantastic. We have fun running and walking together, and doing these things together shows Andi the importance of exercise. For the past year and a half we have been trying to run or go for walks at least five days a week. Here are a few tips I have picked up along the way. 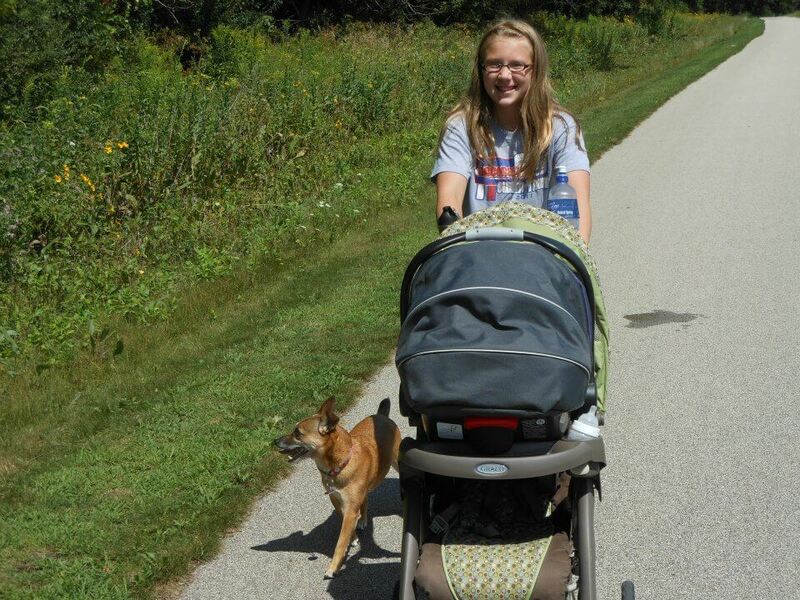 I usually start my run or walk with Andi in the stroller. We go a few miles, and at the end she gets to get out to walk the rest of the way (usually a quarter to a half mile in distance). When it’s Andi’s turn to walk I let her take the lead. I follow her and we take time to stop and explore nature. Sometimes Andi gets fussy when waiting for her turn to run. I recommend bringing books and healthy snacks to keep kids busy while they ride in the stroller. Fruits and string cheese are Andi’s favorites! Make your runs and walks educational and fun. Andi and I take time to spy animals, hunt for colors and letters, and I commentate our adventures to let her know what we’re doing and where we are going. 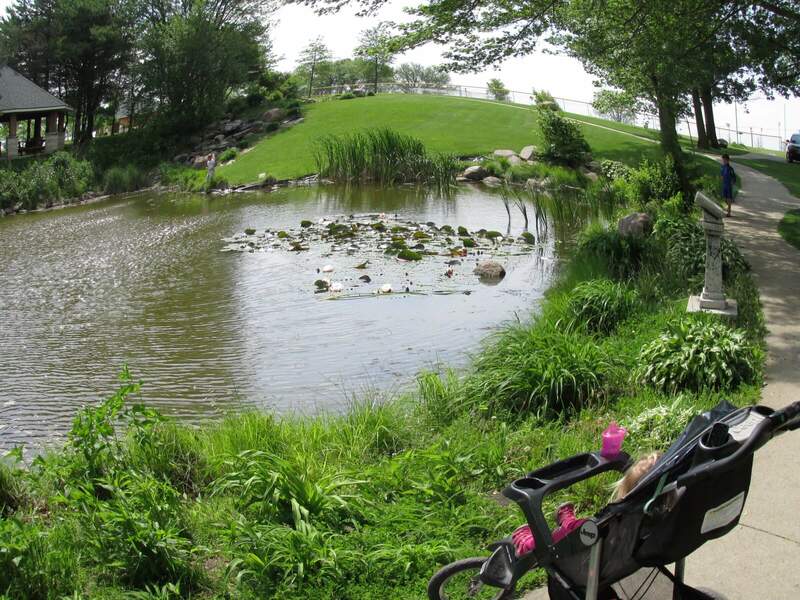 We often end our runs/walks at fun places like the Decorah Fish Hatchery or a favorite park. Having a fun destination is a great way to stay motivated! Andi loves music, so we often sing songs when we’re walking. You can also try playing music from your phone or IPOD loud enough for your child to hear while you go for a run. Andi and I like to explore new places. Try new routes or even different towns when you go out for a run or walk. Stay Tuned for More Running Tips – Next week’s blog will feature additional safety tips and ways to encourage older kids to run and walk. Andi’s first walk with her Auntie Maddie and dog Lucy. A quick stop to enjoy the view during a run around the West Union Park. Keep it up, Shanna and Andi! !